When I think of a True Fashionista, one of the first women who comes to mind is Judith of the blog Style Crone. I have enjoyed her blog and amazing personal style for years and was thrilled when I saw her featured in Ari Seth Cohen’s blog and book Advanced Style. I was so honored that she agreed to be part of this series. Style Crone, as stated on her About page, is “Dedicated to the older woman, in her most creative, outrageous, authentic, powerful, adventurous, funny, and proud era. Let’s take back the word crone, to its original meaning, signifying a woman of a “certain age’ who embodies all her life’s wisdom, knowledge, experience, and love.” Judith’s personal style is so quirky, colorful, sophisticated, and completely unique. 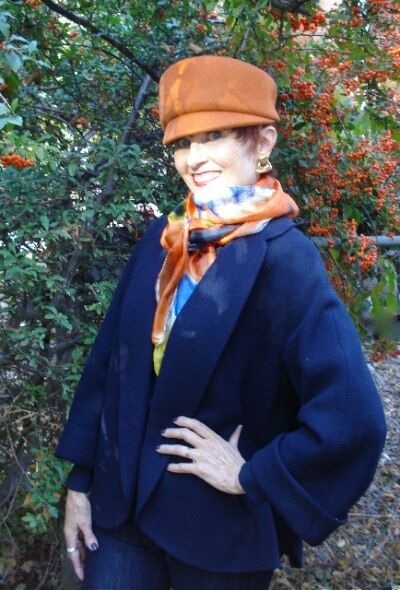 She inspires me to give clothing an atypical new life, to embrace color, and make me crave a fabulous hat collection. I remember when I found Judith’s blog, it was one of her “What to Wear to Chemo” posts where her husband Nelson took her picture while undergoing chemotherapy. I remember reading it and tearing up at my desk, recalling a decade prior when I was in a similar situation keeping Karl company while he underwent the same. Cheerful, positive, and comfortable for long spans of time is a big expectation for an ensemble, but it was a good way to get my mind off things. I could see Judith doing the same with her outfits. Sadly, Nelson lost the battle with cancer; Judith chose pictures for this feature that Nelson photographed, as he was supportive and instrumental in the launching of Style Crone. 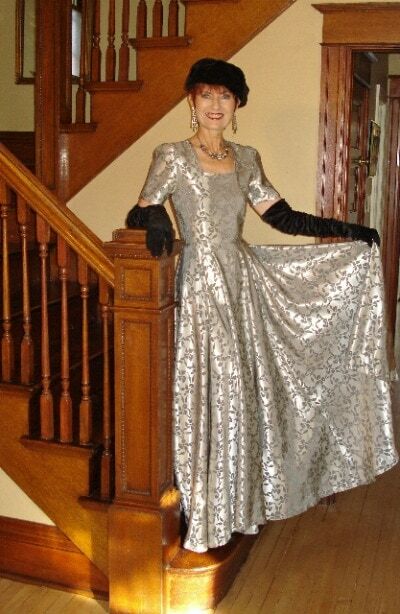 Though Nelson passed in April of 2011, Judith continued with Style Crone, showcasing her amazing ensembles, where she wore them, and why. She journals her life through her ensembles, showing that clothing isn’t simply something that you wear, but a way to express your feelings, your life, and your personality. Here’s Judith’s take on the same five questions I ask of each True Fashionista. I'm a lover of hats, vintage clothing and other recycled pieces. I mix it all together according to how I feel, usually starting with a hat. Over the years I have gathered a vintage and hat collection which I draw from and at this point, as I wildly flirt with 70, I find myself shopping my closet and having more fun with style than ever before. I suppose this could be called eclectic, but I don't really have a label for what I put together. Perhaps quirky? I would say that my passion evolved. I remember enjoying style at an early age, but it escalated during the 70's around the time that a friend owned a vintage store and I began wearing hats for fun and self entertainment. I also discovered estate sales, vintage stores, thrift shops and consignment stores around that same time. I loved finding pieces that weren't found in the usual places. Along with a friend I created a hat shop in the 80's, but continued working as a psych nurse as the business grew. The experience was radically different than working in health care. Choosing outfits, which always included a hat was a way to express myself creatively and became a form of meditation as I approached my day, which usually included extreme and painful stories told by interesting and traumatized people. I find style to be healing and a form of art and self expression. Inspiration is everywhere. The radiantly beautiful diversity of the world's people, nature, other blogs that I love and the internet in general, personal experiences, movies, books, music, history, museums, travel, food, art. Everything about life and the list is endless! Having a space of time to quiet the mind also expands creativity. So many people have defined this difference with eloquence. For me fashion is in the clothes at a certain point in time and includes trends. Style is in the wearer and includes timeless self expression and creativity. Style is a celebration of life and the manifestation of the inner experience projected outward. Be open to experimentation, inspiration and the silhouettes that make you feel good about yourself and bring you a sense of confidence. Consider it a journey and have fun with it! Style is a reflection of your inner self and can change over time with life experiences and shifts in perceptions and passions. Stretch and expand and do something that makes you feel just a little bit afraid. Try on a new persona like trying on a new pair of shoes. Changing an outfit is under our control, as opposed to the many things that we have no power to modify or alter. Thrift shops and consignment stores are great places to explore when searching for personal self expression. The financial output is small and it's environmentally friendly. I wrote a post earlier this year called “When I grow up, I want to be as fabulous as these ladies” and it was inspired by Judith, Une Femme d’Un Certain Age, Patti of Not Dead Yet Style, Pam of Over 50 Feeling 40 and of course, Ari Seth Cohen and Advanced Style. It truly is a joy to see how fashion can continue to be fun at any and every age. Judith is a star, for her creativity, style, and true inner and outer beauty. I love this post as a tribute and as a visual reminder of her incredible ensembles. I’m delighted to find you as well and will be back! Love her hats! Amazing style! Alison, I am truly honored to be included in your Fashionista series. I had no idea that you had a similar experience with Karl and it makes me feel especially connected to you. Your blog has so much life and spirit! Thank you! Thank you. Judith is the poster child demonstrating that style has nothing to do with what it says on one’s birth certificate. What a lovely, eloquent lady! What an inspired and inspiring choice. I find Judith’s blog one of the most gracious on the ‘net, and her personal style is not to be equaled. Brava to both of you!! Thanks for the link to Style Crone! She is amazing. What an amazing outlook on life and style she has! The creative way she puts pieces together is exceptional, but it’s her smile and confidence that really tie those individual pieces together. Thank you for featuring her, Alison…I can see why you admire her!